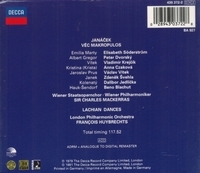 “VEC MAKROPULOS (The Makropulos Affair) is a three-act opera by Czech composer Leoš Janácek. The libretto was written by the composer between 1923 and 1925. THE MAKROPULOS AFFAIR was his penultimate opera and, like much of his later work, it was inspired by his infatuation with Kamila Stösslová, a married woman much younger than himself. The world premiere of the opera was given at the National Theatre in Brno on 18 December, 1926, conducted by František Neumann. Janáek's operatic version was written between 1923 and 1925. Janácek began work on the opera straight away. He wrote the libretto himself, and by December 1924 had completed the first draft of the work. He spent another year refining the score, before completing it on 3 December 1925. Musically, much of the piece has little in the way of thematic development, instead presenting the listener with a mass of different motifs and ideas. Janácek's writings indicate that this was a deliberate ploy to give musical embodiment to the disruptive, unsettling main character Emilia Marty/Elina Makropulos. Only at the end of the final act, when Makropulos' vulnerability is revealed, does the music tap into and develop the rich lyrical vein that has driven it throughout. "Elisabeth Söderström, the Swedish soprano acclaimed for the plangent richness and intelligence of her singing and for her wide-ranging repertory, including influential portrayals of leading roles in the operas of Janácek, was admired by opera lovers around the world, notably in Sweden and England, where she performed most often, within the field she was revered. With her radiant, creamy voice, thorough musicianship and keen dramatic instincts, she was a model for singers. In roles like the Countess in Mozart’s NOZZE DI FIGARO the Marschallin in Strauss’ DER ROSENKAVALIER, Tatyana in Tchaikovsky’s EUGEN ONÉGIN and more, she combined insightful acting with nuanced singing and a lovely stage presence to create alluring and memorable performances. An element of Scandinavian reserve in her dramatic and vocal artistry enhanced her work, lending an elusive quality to her portrayals. Reviewing a song recital that Ms Söderström gave at the Frick Collection in New York in 1975, the NEW YORKER critic Andrew Porter perceptively summed up her artistry. Her ‘quick musical intelligence, her vivid and engaging temperament, and a protean voice not exceptionally powerful but well able to compass soubrette mirth and tragic passion have brought her triumphs in a wide variety of roles’. Anna Elisabeth Söderström made her début as Mozart’s Bastienne when she was just 20 at the Drottningholm Court Theater, on the outskirts of the city, a company she would direct in the mid-1990s. Shortly after her début, she joined the Swedish Royal Opera. She remained a member of that company until her retirement. In her early years she focused on soubrette roles, including Mozart heroines. Soon she was branching out dramatically. Her début at the prestigious Glyndebourne Festival in England came in 1957 as the Composer in Strauss’ ARIADNE AUF NAXOS, and for years she remained a favorite with the festival. Among Strauss singers, she was one of the few to have sung all three lead rôles in DER ROSENKAVALIER: the Marschallin, Octavian and Sophie. A milestone in her career came in the 1969-70 season with the Royal Opera at Covent Garden in London, when she sang Mélisande in an acclaimed production of Debussy’s PELLÉAS ET MÉLISANDE conducted by Pierre Boulez, subsequently recorded. That Sony Classical recording, with George Shirley as Pelléas, is considered by many to be definitive. Another series of landmark performances and recordings involved the Australian conductor Charles Mackerras, an informed champion of the Janácek operas. Ms Söderström became Mr Mackerras’ soprano of choice for his Decca label recordings of complete Janácek operas, including JENUFA and KATYA KABANOVA, with Ms Söderström singing the title roles, and THE MAKROPULOS CASE, a mysterious, haunting work in which Ms Söderström portrayed, unforgettably, the 300-year-old Emilia Marty. Among the many contemporary roles she sang were Elisabeth Zimmer in Hans Werner Henze’s ELEGY FOR YOUNG LOVERS and Juliana Bordereau in Dominick Argento’s ASPERN PAPERS for the premiere production in Dallas in 1988. She was also an active song recitalist. Ms Söderström made her Metropolitan Opera début in 1959 as Susanna in Mozart’s NOZZE DI FIGARO. For the next five years, she made regular appearances at the Met, but then drifted mostly to Europe, returning in the 1980s for performances as the Marschallin in DER ROSENKAVALIER and the Countess in NOZZE DI FIGARO. For her last Met performances, she came out of retirement, essentially, to sing the Countess in Tchaikovsky’s PIQUE DAME, a dramatically complex and crucial role with scant vocal demands. She received an enormous ovation."